To serve selflessly, compassionately, is one of the greatest qualities of being human. When you have done that, your Life will have counted. Over the last several weeks, I have been watching my wife Vaani care for her dad. He’s 84 and is paralyzed on the left side having suffered a stroke earlier this year. His speech is impaired too. With an additionally agonizing prostrate condition, he is bed-ridden. The patient care team we have recruited to attend to him at home is inconsistent and low on quality. So, Vaani has had to not just lead the entire 24×7 operation of looking after him, she has often had to manage every bit of it. Whether or not the nurse shows up, whether or not the doctor is accessible, whether or not family members are willing to chip in and help beyond what they want to do, Vaani has never complained even once. She, in fact, personifies ‘devotion’ through the way she cares for her father. I must confess that I can never quite achieve her level of commitment to such a cause. Of course, I support her with all the logistics required to run the 24×7 operation. And her sister and brother support us too with the infrastructure and resources. But I believe we are all light years behind her when it comes to being selfless and unquestioningly compassionate. I am still learning this way of Life. I am not even a beginner. I have not even reached the play-school stage. I am just an infant waiting to be served. But Vaani inspires me. And she humbles me at the same time. This may appear to be a paean in my wife’s praise. Let me clarify that this is more than just that. It is a celebration of what it takes to be human. 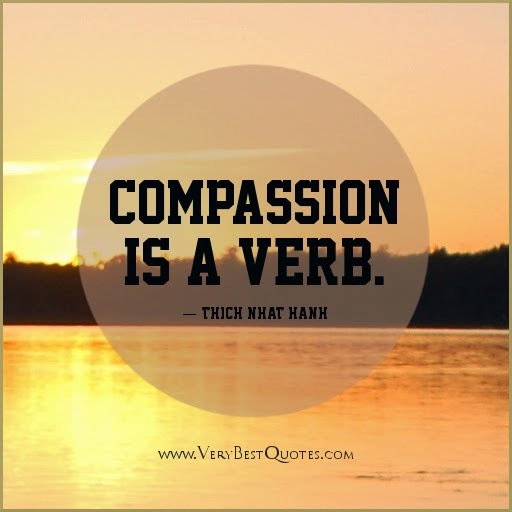 It is an invitation to understand what compassion is. And a call to learn to be compassionate. If each of us can embrace this quality we can enhance our humanness. And make our world a lot better than it is today!